A look inside a massive new climbing gym in Atlanta. WHEN IT OPENED on June 19th,Stone Summit Climbing & Fitness Center became the largest rock gym in the United States. 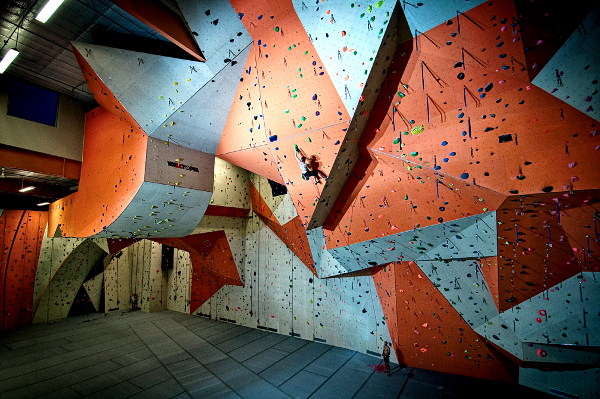 The gym has over 30,000 square feet of climbing surface, including a bouldering room and roped walls ranging from 25 to 60 feet in height. It may be new, but Stone Summit has already started to attract big events: the gym will host USA Climbing Youth Nationals from July 8th to July 11th. Browsing around the company’s website, one of the things I found most appealing was the invitation to introduce children to climbing. While the climbing component of Stone Summit is clearly the main draw, the center also offers yoga and spin classes and has cardio equipment, circuit training, and free weights. Day passes to the center cost $12 for adults and $10 for children. See how to construct your own (smaller) climbing wall.